“It’s a sad day in Civil War history,” my friend Frank said to me yesterday. It was April 9. “Depends on whose side you were on,” I said with the hint of a chuckle—but Frank looked like he was ready to go to a funeral. “Well I’m south of the Mason Dixon,” he said, as though that explained it. I gave him a wink so he’d know I was just doing a little Civil War trash talking–as much poking fun of myself for carpetbagging–but Frank’s walrus moustache seemed to droop even more. With his mane of white hair, in an Antebellum time he might’ve gone by the name “Colonel.” Today he seemed a little lost. People still feel bruised 150 years later. Not everyone—but a surprising number. What surprises me, though, is the number of those same people who turn around and shout the jingoistic-style “’Merica!” brand of patriotism: flags and eagles and “These colors don’t run.” Uncle Sam has his shirt sleeves rolled up and will punch you in the face as soon as the NASCAR race is over. They often espouse smaller-government philosophies (a political point of view I tend to agree with myself, as it happens). Perhaps that is in keeping with their Confederate forbearers—yet the Confederate government trampled on personal liberties in far-reaching ways as it scrapped for its own survival. Folks tend to forget that in the post-war haze that is Lost Cause-ism. Ironically, the banner of smaller government is carried today by the Republican party–the same party that forced Lee’s capitulation at Appomattox. The party of Lincoln and Grant. The layers of cognitive dissonance to all that dizzy me, which is probably why so few people spend time actually thinking about it. It’s easier to yell “’Merica!” than examine contradictions. And I’ll add one more layer–one I find oddly comforting yet sometimes disheartening. As a country, we are a marvelous tapestry of interwoven contradictions. That’s part of what makes us Americans. We might not always be all that tolerant of each other, but we do, by and large, manage to coexist okay. High-profile hate crimes of all sorts call attention to the fact that there remains a lot of work yet to be done, but like anything in the media, bad news gets disproportionate coverage. We don’t see a whole lot about all the folks who are getting along okay. They’re all around us. There are a lot of “–isms” still out there: racism, sexism, classism, homophobia (which is still an “–ism”), Lost Cause-ism, carpetbaggerism, etc. That’s too bad, because most folks are just trying to get by. Most folks are a bit overworked, behind schedule, and hoping for the best. We want good things for our kids. Mason-Dixon Line or not, that puts us all on the same side. This entry was posted in Civil War Events, Memory, Sesquicentennial and tagged Appomattox Court House, Memory, thoughts-on-Appomattox. Bookmark the permalink. You’re talking about that strong Scots-Irish vinegar that still runs through the blood of people from the southeast USA. Ever read “Born Fighting” by Webb? Or for a more academic approach, Albion’s Seed by Fischer? Both marvelous books on the subject, and helped me understand why, as I used to sit on my balcony in Arlington, VA and watch “Rolling Thunder” growl up 395 towards DC each Memorial Day weekend, I’d see no shortage of Vietnam vets sporting the rebel battle flag right next to old glory off the backs of their Harleys. When the US entered WWI, war planners figured southern boys wouldn’t sign up, having grown up at the knees of their grandads who fought against the Stars and Stripes from Manassas to Appomattox. But they signed up in droves, and continue to over-represent in the military today. Although white Southerners by and large stayed out of the Spanish-American War, preferring to let Yankees, Westerners, and African Americans do the fighting, partly because of white paranoia about leaving their women defenseless against blacks in the neighborhood. Something popular history tends to ignore. See a recent article by David Turpie in the Journal of Southern History. Thanks for the suggested reading. I’ll take a look. I love the image you paint of the Harley riders, btw. Great post, Chris!! I attended ROTC officer basic in the summer of 1971 from St. Bonaventure. In my platoon, I was the only New Yorker. Most were from the deep south with VMI, the Citadel and other bastions of the South. well represented. Most were ready for Viet Nam and wanted to fight for their country. Dixie was a popular barracks ballad as were a number of Christian hymns (sorry, I’m Catholic, don’t know any!). 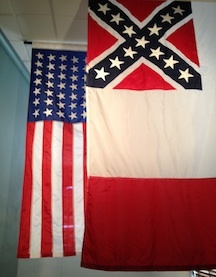 Stars & Bars, Stars and Stripes. All the same. Just don’t say you never heard of New Market!! Yup, contradictions all over the place. Thanks, John. Great story. And despite those contradictions, I bet you all generally got along okay and had each other’s backs. That’s the great genius (and great mystery) of America, I suppose! That’s exactly why I specifically say it’s not everyone, Rob, and that’s why I specifically don’t use the word “redneck.” Maybe I am stereotyping, but there’s a lot of demographic data to suggest it’s more than that, too. As just one example, demographically, the core of the NASCAR fan base is from the South: http://www.brentsherman.com/PDFS/NASCAR.pdf. For other examples, take a look at advertising and merchandising. There’s enough data to suggest that, indeed, the people I talk about DO exist–but it’s NOT all Southerners. I just mean that “carpetbaggerism” still exists–there are still people who get resentful of Yankees who move to the South. I get some good-natured ribbing about it from some friends–and I tease myself about it, too–but I also occasionally hear people make less-than-good-natured comments about it (usually when they don’t realize I’m from western NY). It’s not often, but it does happen. Compared to other “-isms,” it’s hardly a problem, but such prejudice exists large and small. NASCAR–the new polarizing sport. Not football–oh no! Why, football brings us all together!